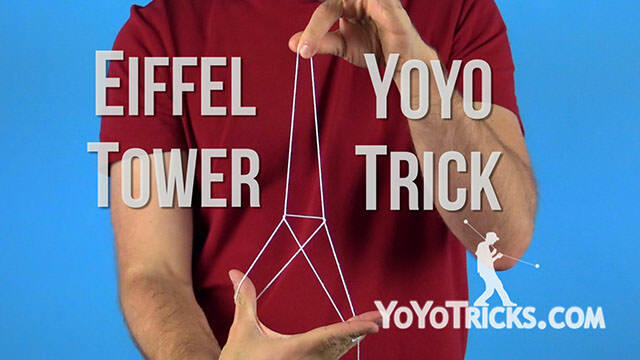 The Eiffel Tower is a classic trick, and it is pretty easy, but it is one that is sure to impress your friends and family, especially if you are just getting into yoyoing. So, it is a picture trick, and just like any picture trick, it is going to be a lot easier to learn if you let the yoyo hang down at the bottom of the string without spinning. I’m going to teach you this trick in three easy steps. The fist step is the slingshot. To setup your slingshot all you’ve got to do is extend your yoyo hand forward, make sure you keep your thumb out. Then you are going to pinch your thumb and your first two fingers of your opposite together, and then you are just going to pull the string through your yoyo hand – just like a slingshot. That is step 1. Step 2 is where we are going to thread the needle. We are going to come down here – and see how when we bring our opposite hand down it makes this little triangle with the string? – we are going to use our first finger that is now free on our opposite hand. We are going to grab the string coming up off of the yoyo and we are going to thread it through this triangle right here. As you do that, let the rest of the string drop off of your opposite hand, and you will be setup just like this. The last step is where you are going to do the twist. You are going to twist your yoyo hand forward, and you are going to extend your thumb toward you – you can see the trick is already starting to take shape – so all you want to do is pinch the string coming off the yoyo in-between your middle finger and your ring finger. You can see that forms the Eiffel Tower. Sometimes you will want to give it a little bit of an adjustment to adjust the way that it looks so that it looks perfect. Let me show you that one more time from a different angle that will definitely help you out. Again, to start you are just going to extend your yoyo hand forward and make sure to extend your thumb as well. 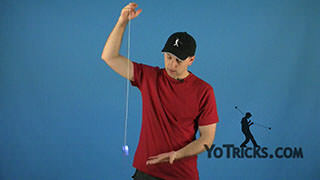 Then pinch your thumb and the first two fingers of your opposite hand together and then pull the string through your yoyo hand just like a slingshot. You are going to bring that hand down, which will create this little triangle here. You are going to take your first finger and pull the string coming off of the yoyo through that triangle, and then let the rest of the string fall off the finger and thumb of that hand. 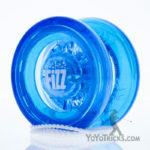 Then you are going to twist your yoyo hand down, when you do that make sure to point your thumb at yourself. Then just pinch the string coming off the yoyo between your ring finger and your middle finger, just like that. Give it some shape, and that is the Eiffel Tower. Once you have practiced the trick enough times and you feel like you really have it down, you can try it with the yoyo spinning. If you can get the trick to happen and bring it back to your hand before the spin dies, you have mastered the Eiffel Tower.